For those hangry days when you NEED something fast, but want it to taste ah-mazing like you worked super hard in the kitchen for hours putting together a flavor profile that is going knocking your socks off… This delicious Vegan Greek Chickpea Salad is that dish! Not only is it fast, easy, and bursting with flavor, but it’s oh-so-healthy! 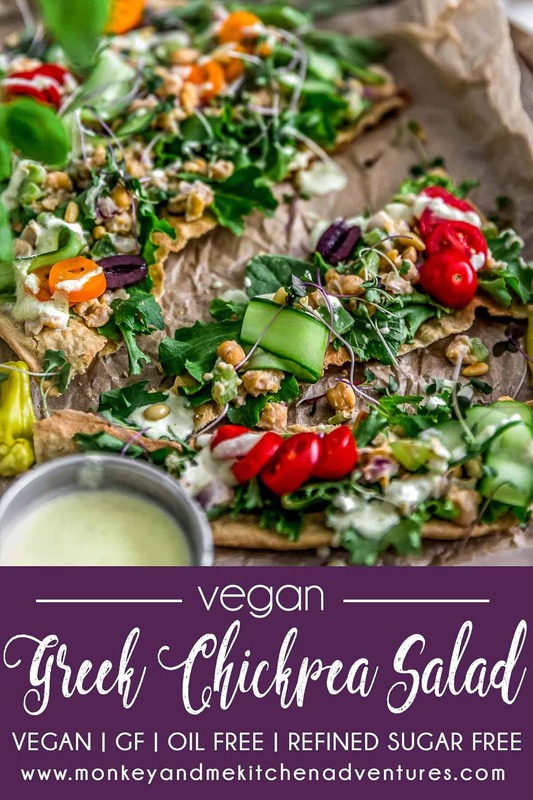 Protein-Packed chickpeas, coupled with crisp green bell peppers, and diced red onions mixed with a tasty tahini-yogurt dressing is your ticket to flavor-town with the first bite. 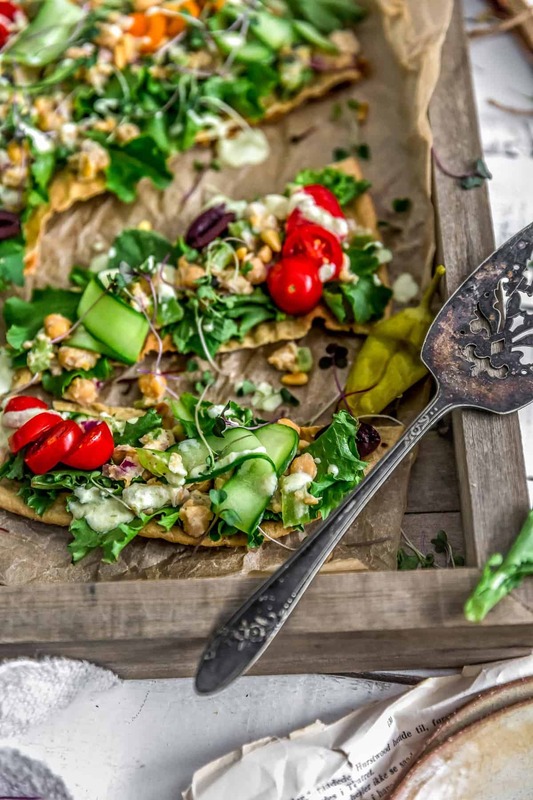 Add this hearty Vegan Greek Chickpea salads to a bed of nutritious greens, a quinoa flatbread, lettuce cups, pita pocket, and so much more! Whole Food Plant Based, Vegan, plant based, oil free, refined sugar free, no highly processed ingredients and gluten free. I absolutely adore our Greek Chickpea Salad dish. It is so versatile. You can make sandwiches, wraps, lettuce cups, or even put it on a flatbread; which is exactly what we did! 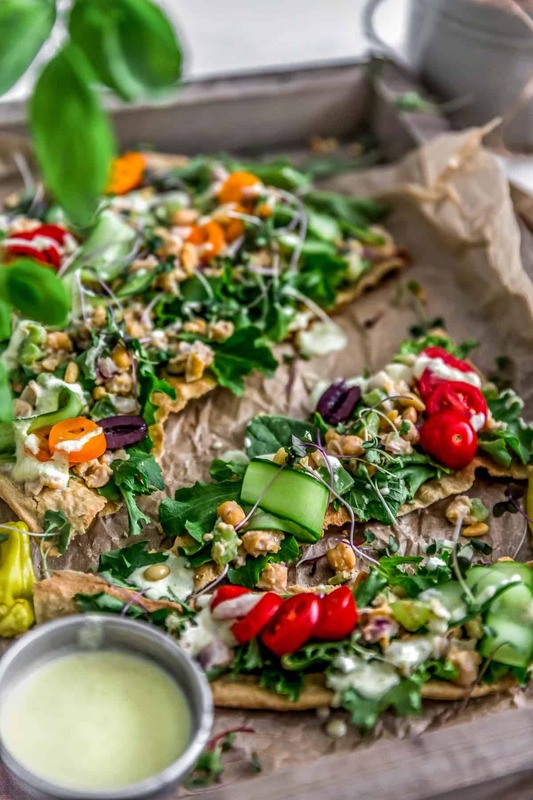 Aaaaaand, we fell in love with our Vegan Greek Chickpea Salad flatbread with generous dollops of our Oil Free Pepperoncini Dressing! Sooooo utterly flavorful and delicious! Allow me to tell you all about it. 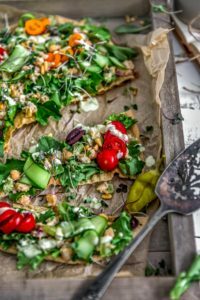 We are constantly making our Quinoa Flatbreads because as most of our readers know by now, (if you are a regular reader of our blog), then you know that we are a gluten-free family, anddddd our Quinoa Flatbread tastes AH-MAZING. 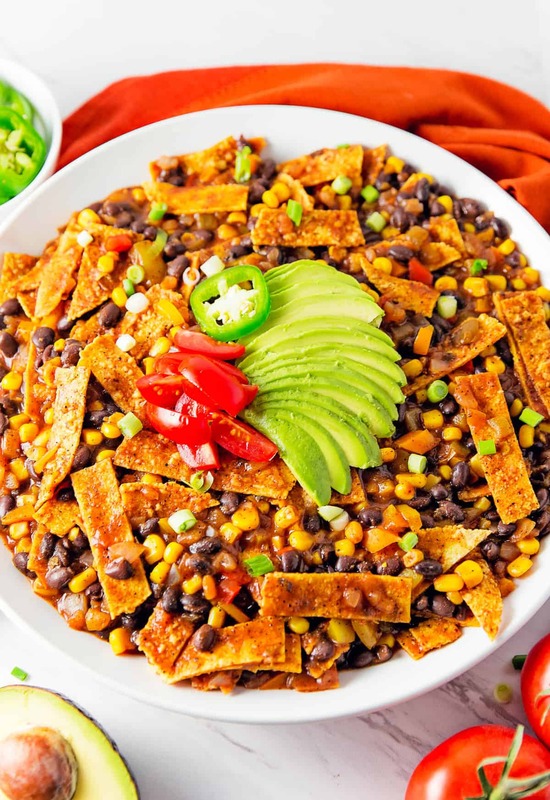 All of the recipes on our blog are Whole Food Plant Based compliant, vegan, and gluten-free. We have family members with Celiac Disease. And you also know that finding a WFPB compliant store-bought bread that is also gluten free is well . . . impossible, there isn’t any such thing out there. If the bread is WFPB compliant, then it has gluten or some other non-compliant ingredient. *sigh* Not to worry though, we have our Quinoa Flatbread, which we adore and make often. 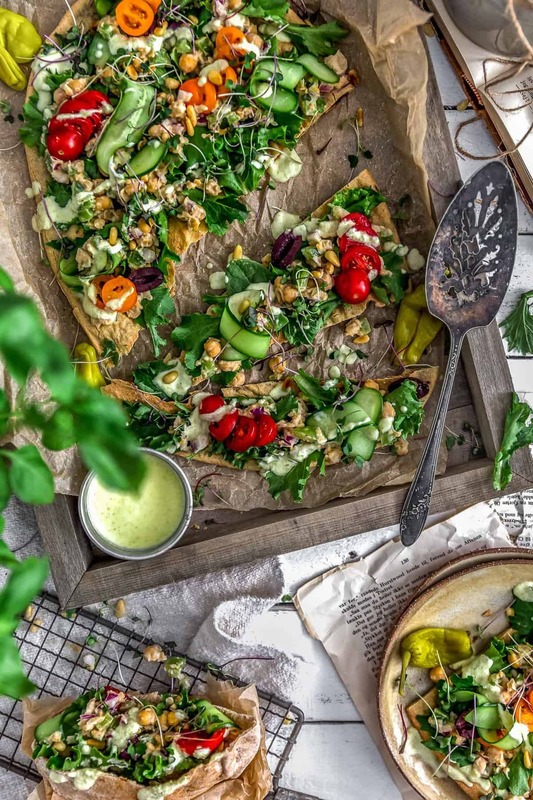 Our Quinoa Flatbread makes for the perfect pizza shell to house our delicious Greek Chickpea Salad pizza. First, we made our traditional quinoa flatbread recipe, then sprinkled a tiny bit of oregano on top before baking. We also made it into an oblong shape rather than the traditional round pizza shape and baked it to crispy perfection. 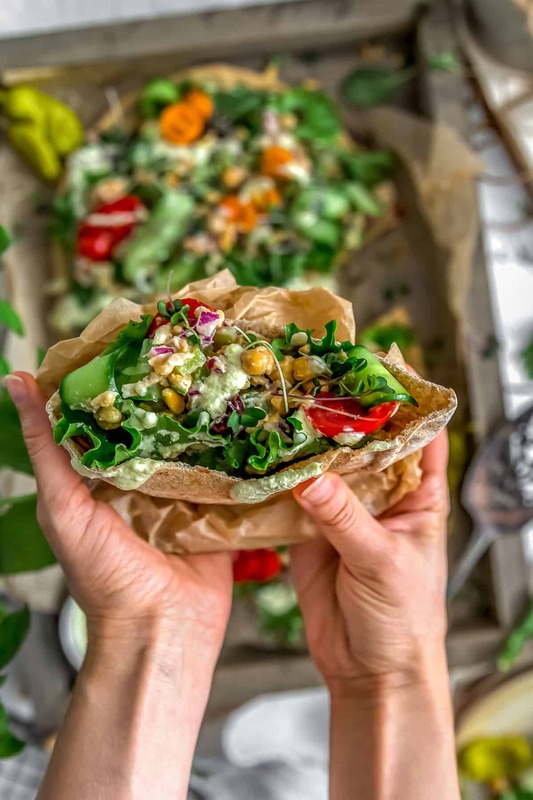 Once out of the oven, and cooled for a few minutes, and trying to keep my hands off it, we loaded it up with some tasty salad greens, our Greek Chickpea salad, and healthy dollups of our Oil Free Pepperoncini Dressing. We then added some cherry tomatoes, ribboned cucumbers, toasted pine nuts, Greek olives, and microgreens. It just doesn’t get any better than this. I am seriously craving it as I type this up, but I am testing a new recipe this afternoon, so it will have to wait a day or two before making it again. The Oil Free Pepperoncini Dressing just sends the whole flatbread over the top. It is the perfect complement to the Greek Chickpea Salad. I must admit Mom had to push me on this because I thought the pizza was perfect just as a Greek chickpea salad, but she insisted that we put the dressing on the top and boy-o-boy was she right! Soooo gosh darn flavorful and just awesomely delicious! Monkey, I just knew! 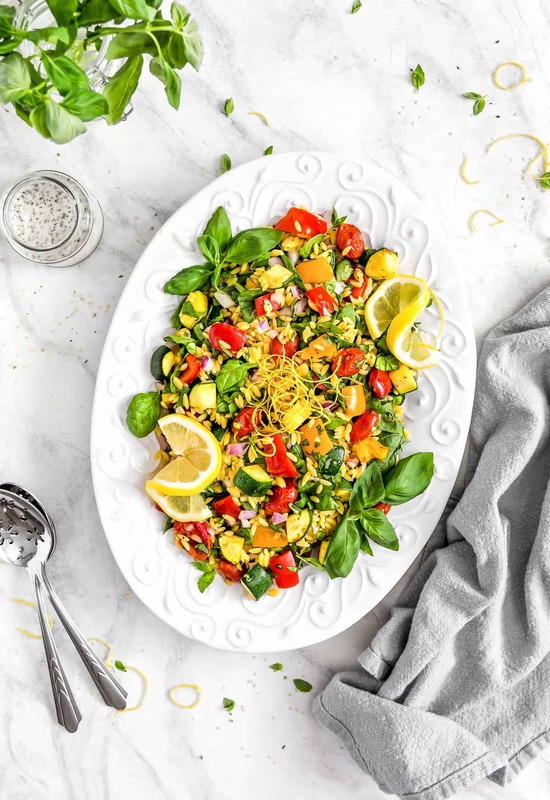 Our Oil Free Pepperoncini Dressing is the perfect pairing with this delicious Greek Chickpea Salad. We even drizzled it on lettuce cups. TP109 had it on his wrap and gave it a 9.9 rating. He only saves perfect scores for those recipes where he had direct input on changing ingredients. HAH! We certainly hope you give this deliciousness a try. You will want to throw napkins around the kitchen after the first bite! 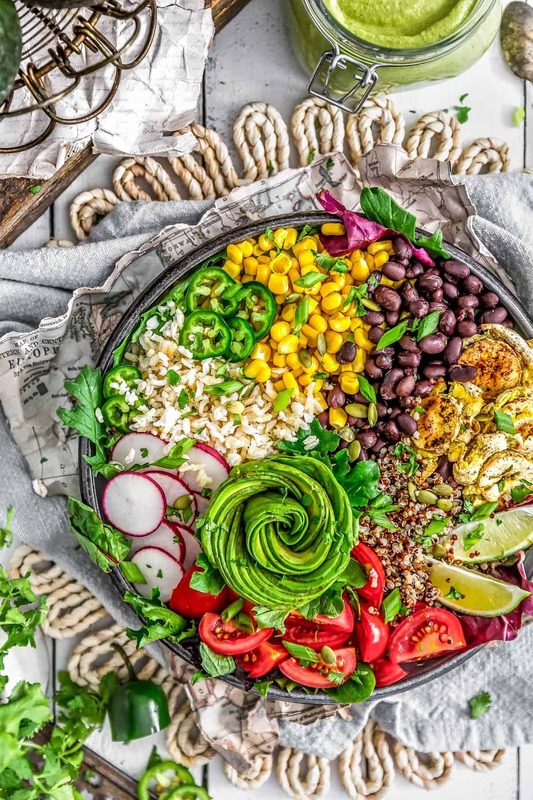 For those hangry days when you NEED something fast, but want it to taste ah-mazing like you worked super hard in the kitchen for hours putting together a flavor profile that is going knocking your socks off... 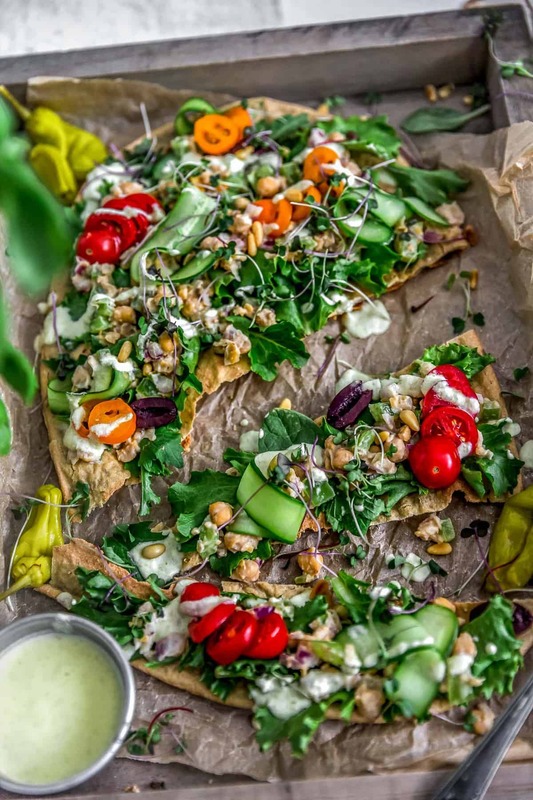 This delicious Vegan Greek Chickpea Salad is that dish! Not only is it fast, easy, and bursting with flavor, but it's oh-so-healthy! Protein-Packed chickpeas, coupled with crisp green bell peppers, and diced red onions mixed with a tasty tahini-yogurt dressing is your ticket to flavor-town with the first bite. 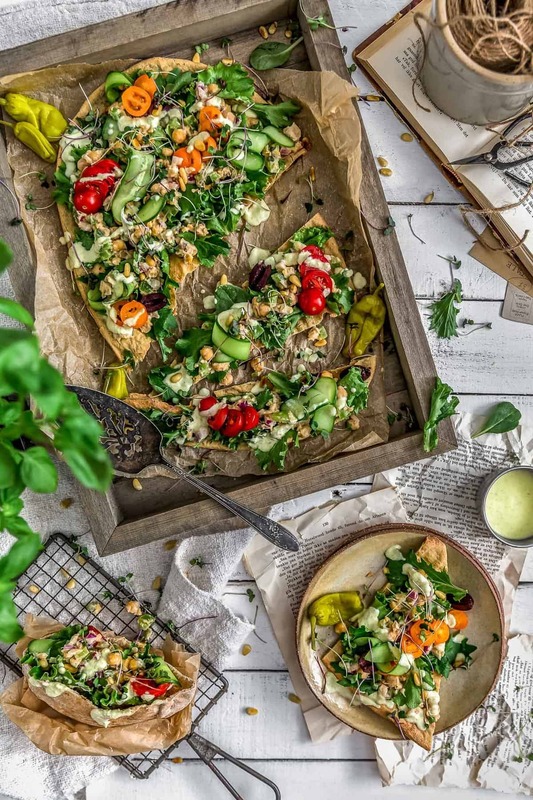 Add this hearty Vegan Greek Chickpea salads to a bed of nutritious greens, a quinoa flatbread, lettuce cups, pita pocket, and so much more! Whole Food Plant Based, Vegan, plant based, oil free, refined sugar free, no highly processed ingredients and gluten free. Place all the Dressing Ingredients into a small bowl and whisk well. Set aside until ready to use. Place the chickpeas into a large bowl and coarsely mash them with a potato masher. Do not create mush. Add the diced green bell pepper and diced red onions to the mashed chickpeas. Mix well. Then add the dressing, stir well to combine. Taste test and add more seasonings, if desired. Serve on your favorite bread, pita, lettuce cup or as a pizza salad.